Don't miss the BIGGEST sale we've ever had at LWD! Over 150 sample gowns will be marked down to $500, $750, or $1000! 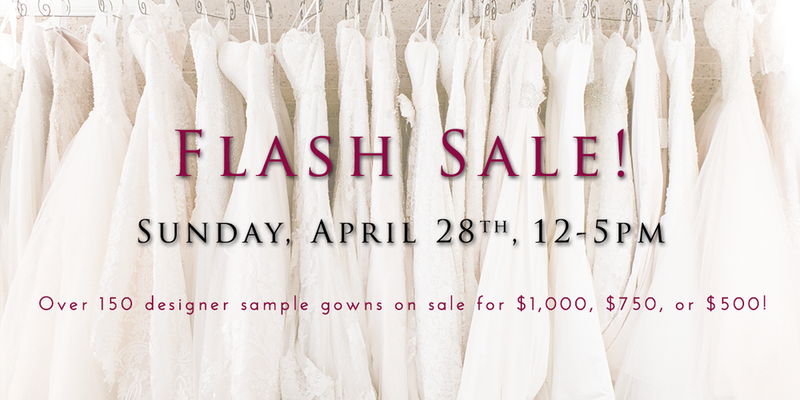 Our flash sale will be fun, energetic, and fast-paced for brides looking for an incredible deal on their gown. To prepare for a successful experience during our Flash Sale, please carefully review below! · Walk-ins only. We recommend arriving early to ensure you have the best selection. Doors open at 12pm. We'll have some yummy treats for those waiting in line for their turn! · Each bride will have 45 minutes with a dedicated stylist and fitting room. We are unable to accommodate longer appointment times during the sale. · A maximum of 3 people are allowed per group, including the bride. We are unable to accommodate larger groups during the sale. · The gowns on sale and the prices of specific gowns have not been released to the public and will not be until the Flash Sale begins. All sample sale gowns will be priced at either $500, $750, or $1,000 between 12-5pm on this date only. · Sample sale gowns are the only gowns available to try on during the sample sale. If a bride would like to try on non-sample sale gowns, we request that she schedules a regular appointment on another date. We are happy to arrange this for you! · Sample sale gowns are paid in full and the bride must take it with her that day. Storage options are not available at LWD. · Cash and Credit Cards (Visa, Mastercard, American Express, and Discover) are accepted forms of payment. We are not able to accept checks during the sample sale. · The cost of alterations, cleaning, and any repair needed on the gown are the responsibility of the customer and are separate from the price of the gown. · We are unable to put sample sale gowns on hold for any length of time. · Returns, exchanges, or refunds cannot be accepted after purchase. All sales are final. Little White Dress carries the highest quality designers. Sample sale gowns are an opportunity for brides to wear a designer gown at a steal! If you have any questions about our Flash Sale, please call us at 303-814-8972!